Welcome to Online Scheduling with Rebecca Cook at The Right Step! On the very supportive end there is the Stress Free Emotions Coaching package. Individual Emotion Release sessions are also available through email or Facebook messaging. 99% of problems are related to trapped emotions affecting physical health. These 1:1 Emotion Release sessions may provide the breakthrough you are looking for. If you want practical stress management at a very nominal cost, the most affordable option is the bi-montly stress management group. Look at the topics and join in while we release stress and learn more about living life to its fullest with a like-minded group of women. Are you a horse lover? Online learning is available to complement your goal on having a stress free relationship with your horse. Check out the services below to see which one best suits your needs. send me an email with your inquiry if you have any questions or special requests. Sometimes off hours and weekend appointments can be available for private lessons or stress relief bodywork, just ask. Professional Bodywork, Equine Movement Re-Education, and Stress Healing Sessions are completed by Rebecca Cook who has over 25 years of expertise and training in wellness and stress relief. Sessions are primarily out-call (at the convenience in your house or business) and must be safe for your therapist as well as meet criteria as outlined in the session description. Please note the therapists home is not handicapped accessible, scheduling is limited there only upon personal request, and you must be able to ambulate on stairs. Session fees are due when scheduling your appointment. If applicable, you may go online and change your appointment day/time up to one day (24 hours) prior to the appointment date. The full session fee is due for no-shows or late cancellations with less than 2 hours notice from the appointment time. Late cancellations and/or rescheduling requests with less than 24-hours notice incur a $30 charge. We reserve the right to refuse to reschedule any no-show appointments. Package services are non-refundable and must be used within six months of purchase AND/OR as outlined in the particular package service description. There are no refunds for unused services. April is Occupational Therapy Month - Join in for FREE this month and make your money dreams come true! Natural bug spray, sleep support, uplifting emotions, pain relief, scar and skin healing, natural acne remedy, respiratory/flu immune boost. Price includes postage. 99% of your behavior has emotional underpinnings. Release negative subconscious emotions to improve your health, relationships, happiness, and success. See Emotion Code Session for Explanation of this service. This is for a discount package of 3 Emotion Code sessions. Create. Inspire. Impact. Connect. Grow. Rise. Shine bright. This is for smart, successful, and heart centered women who want to overcome professional burnout, turn around health challenges, and begin feeling like themselves again in three months. Convenient online coaching for women. Busy life? Conveniently schedule in your office or home. Price includes travel within Grass Lake, Michigan area. New patients please schedule your free consultation prior to scheduling an outcall service. Acute or chronic pain. Schedule your three sessions closely together to boost your personal healing and move it forward more quickly. Stress creates a number of negative physical effects on the body. Ease pain while we work together to bring your body back into the parasympathetic relaxation and healing mode. Great for ongoing immune support and body balance. Schedule a session once a month to maximize your health. Need help with an acute short-term injury. 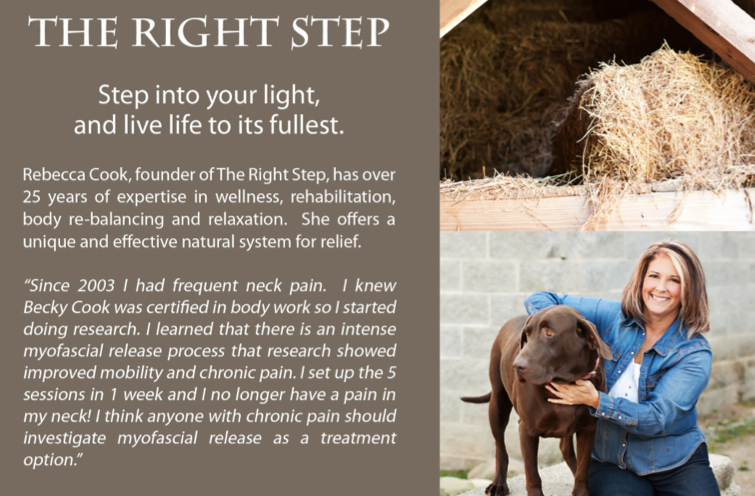 Innovative natural science-based treatments using laser, essential oils and myofascial release. This is for people who have tried the 25-minute session above or have completed the 3-session package and just want a single session with a more intensely focused healing time or need work on more than one area. *If you are paying with your HSA funds or submitting your receipt for insurance, you will need a physicians prescription for Occupational Therapy and/or Massage Therapy. Life changing confidence in only two short months. Learn foundational skills in nine horse lessons, get one stress reducing roll-on, one workbook on saddle fit, one workbook on massaging away horse tension, and five proven relaxation exercises! Relationship based riding lessons reduce fear and pain for both horse and rider. Explore ways to help massage and calm your horse, and evaluate your English or Western saddle fit in your first lesson. You might identity with this person who wrote about saddle fit on a message board on the internet: "My gelding is very “stocky” my current saddle is too narrow, I think that’s why he doesn’t like to bend and do circles. I’ve tried several saddles that I borrowed from others, and even bought a new one thinking it would work, full quarter horse with 7″ gullet. It was better but still restricting. I don’t want to keep making mistakes, how do I get it right ..."